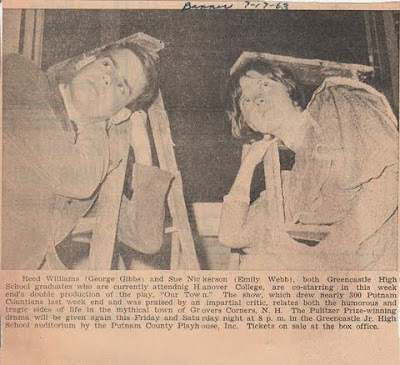 Putnam County Playhouse: HISTORY IN PICTURES!!! 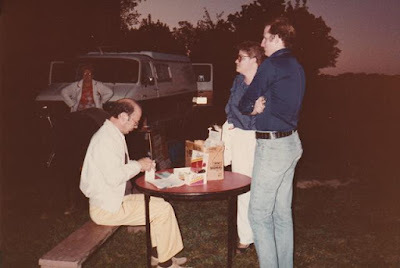 Last year, Jim Poor donated many photos and documents from his years of participation at Putnam County Playhouse to us. We thought we would share a few of them with our readers. Jim has been active at PCPH since 1962. He is a long-time board member, and he also served as President of the board for many terms. Jim gave us many scores and scripts from plays and musicals he was involved in over the years. Interesting newspaper articles and meeting minutes illuminate the early years of PCPH. 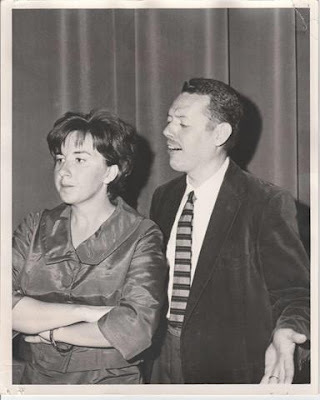 Lois Martin, Jim Poor. 1965 "Come Blow Your Horn"
After organizing in 1961 as Greencastle Summer Theater, the group presented its first full production Blithe Spirit in July, 1962. As Jim wrote in his history of PCPH published in the Banner-Graphic in 2011 - "We were off and running." 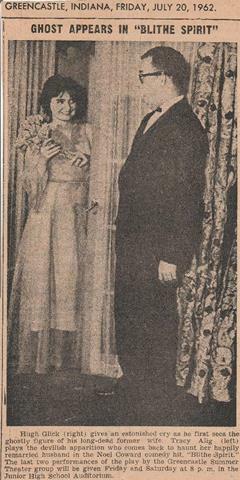 Tracy Alig & Hugh Glick in "Blithe Spirit." 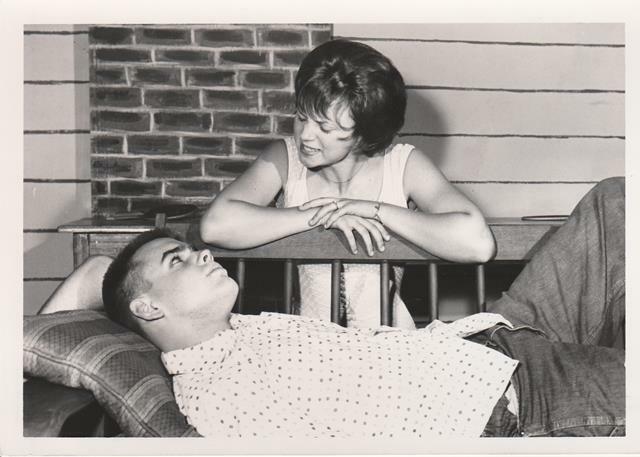 Another popular show presented during those early seasons (at the old Jr. High School Auditorium) was Thornton Wilder's Our Town in 1963. Ray Mizer as he Narrator. The comedy Kiss and Tell was also popular with early Putnam County Playhouse audiences. 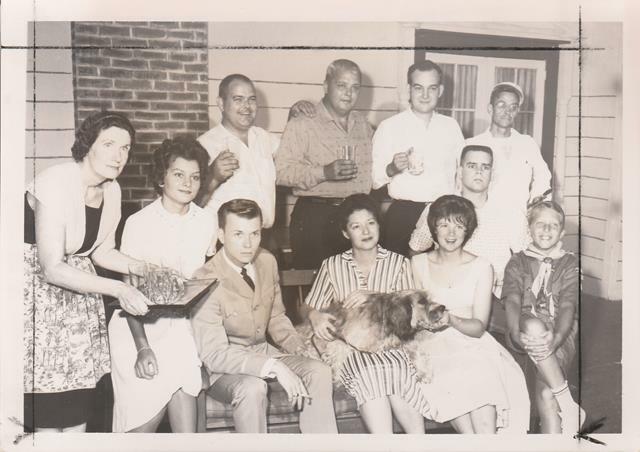 Top Row: Ray Brush, Frank Livernoche, Jim Bunnell, Reed Williams (below) and Ray Mizer. 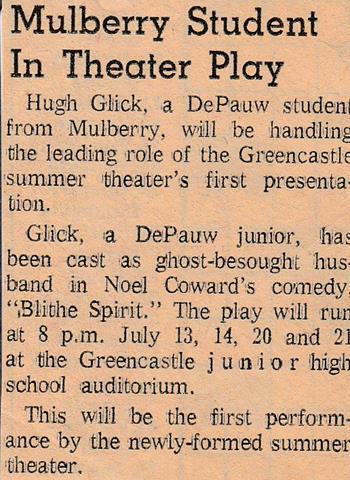 Musicals were also a big part of the program for PCPH in the early years. 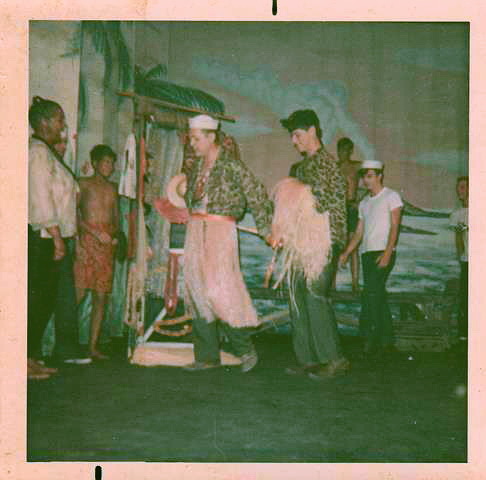 Jim appeared twice as Billis in South Pacific. 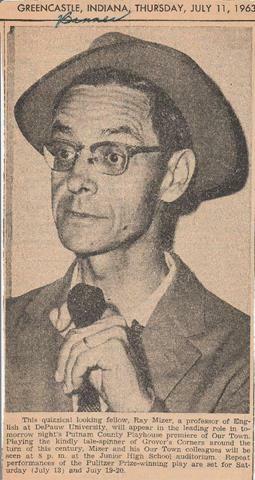 Jim Poor as Luther Billis in his grass skirt. 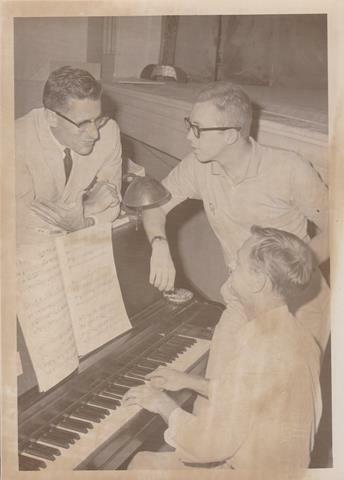 Pete Hill, Charley Aker & Unidentified working on music. In 1981, Putnam County Playhouse moved to its current location. 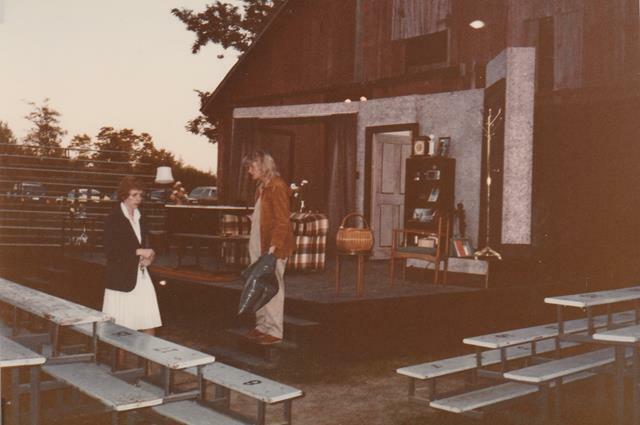 While the board raised the funds to convert the larger barn into a theatre, they presented shows on the outdoor stage. 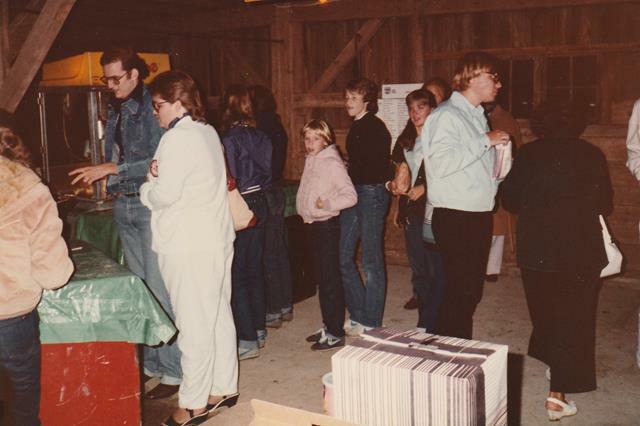 That stage was located in front of the small barn. Audiences paid $3 per ticket and sat on bleachers to enjoy the show. 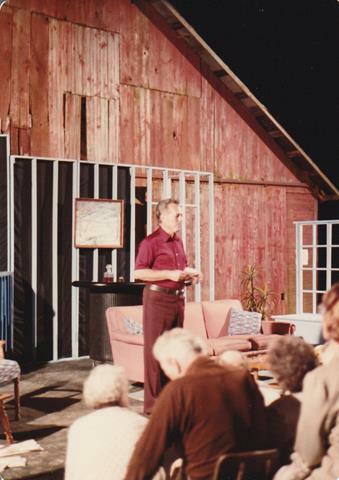 Jim gives the curtain speech before a September, 1981, performance of "Mary ,Mary." Longtime PCPH Treasurer Don Holley sells tickets circa 1981. Refreshments were sold inside the Big Barn. Cast member Joetta Milligan and Director Judy Huter check out the stage before a performance of "Dial M for Murder" in September, 1982. Thanks, Jim for sharing these photos with us. We've come a long way! 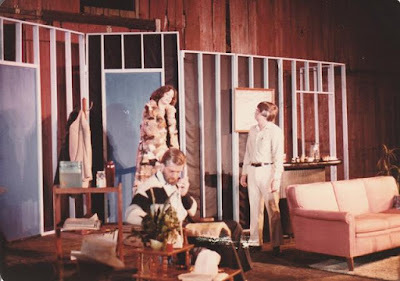 The history and the story of Putnam County Playhouse is all about the people who have been with us along the way. We encourage everyone to come out and get involved with us during our 2016 season. Watch this website and our Facebook pages for opportunities.